Two men have been charged on suspicion of travelling to Syria for terrorism, West Midlands Police have said. Yusuf Sawar and Mohammed Ahmed, both 21, from Handsworth, Birmingham, were arrested at Heathrow on Monday after returning to the UK from Turkey. 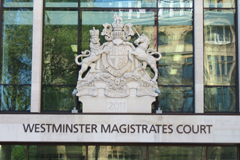 They will appear at Westminster Magistrates' Court on Saturday. Separately, a 21-year-old man from the Sheldon area of Birmingham was arrested at Gatwick on suspicion of attending a "terrorist training camp" in Syria. He was detained by counter-terrorism police after returning from Istanbul, West Midlands Police said. Police had earlier said the arrest was not connected with the two men held at Heathrow earlier in the week. The pair are suspected of travelling to Syria in May last year.